The Centers for Disease Control (CDC) reports that approximately 9.5 percent of children in the United States have been diagnosed with Attention Deficit Hyperactivity Disorder (ADHD). Learn about a technique that can improve symptoms of ADHD and increase coping mechanisms while having fun — art therapy. With diagnoses of ADHD in children on the rise in the U.S., parents can help their children through art therapy with fun, simple projects that focus on process over product. Generates a relaxation response and improves a child’s mood. Increases brain levels of serotonin, the lack of which can lead to depression. Reduces stress hormones — manipulating clay can have a more profound effect than squeezing a stress ball. But Nelson says many parents — unsure of their own art skills — shy away from art therapy, unaware that the creative process is beneficial regardless of the outcome. Nelson outlines a few tips parents can use to integrate art therapy techniques into their own homes. Focus on the process, not the product. If the child is unsatisfied with her final product, ask questions about what she would do differently in the future, to encourage problem-solving skills. Reduce chaos. A messy space can overwhelm a child with ADHD. Instead, clear out a specific space for art making and limit the choices (keeping in mind the child’s interests) to promote focus. Start with Mandalas. These pre-drawn circles on a piece of paper capture a child’s attention. 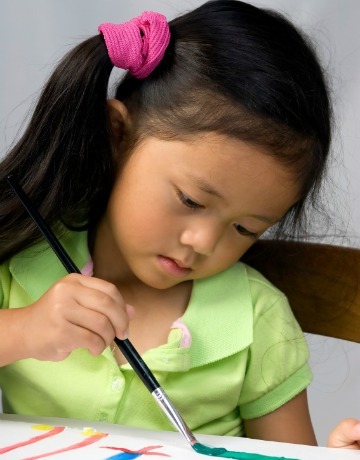 Having a starting point lessens a child’s anxiety about what to create when facing a blank paper. Free Mandalas printables are available online. The amount of time spent working with art therapy varies by child and treatment goal, Nelson explains. She currently works with school children who have Individualized Educational Program (IEP) art therapy goals, so she recommends weekly 30-minute sessions. Nelson says effective art therapy gives a child enough time to reach a level of completion and also be able to spend some time talking about the project — either during the activity or after its completion. No matter how long you spend with your child, Nelson emphasizes the need to focus on process over product. “The experience of making the art and the child having a way to express [him- or herself] is far more important than creating a perfect painting or sculpture,” she says. Go on a nature walk. Collect small objects that are appealing to your child and talk about the shapes, smells and textures of each. Glue objects to cardboard to paint or leave as is. Create leaf rubbings by placing paper over leaves and rubbing the top of the paper with a crayon so the leaf texture becomes visible. Buy inexpensive wood crafts to paint or decorate. Make sand jars or salt jars. A quick search of Pinterest for “art therapy for kids” delivers unlimited creative ideas.